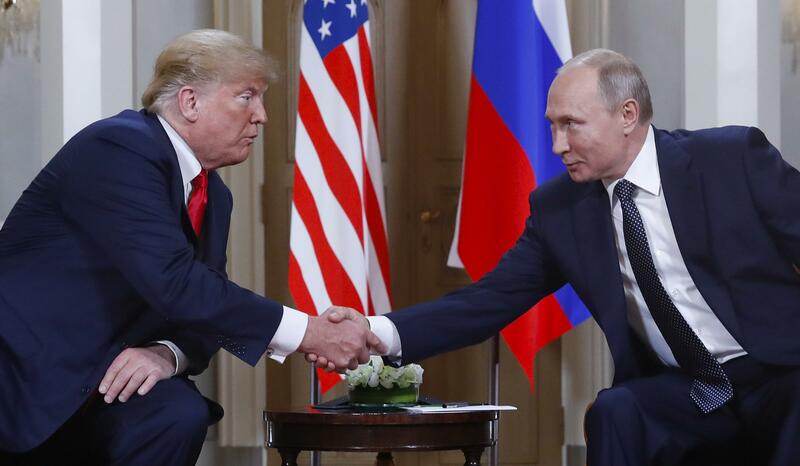 President Trump and Russian President Vladimir Putin shake hands at their summit in Helsinki, Finland, on Monday. Trump upset many in the U.S. intelligence community by refusing to endorse their finding that Russia interfered in the 2016 presidential election. Putin said he favored Trump in the election, but did not indicate whether he did anything to help him. But last Friday, Coats spoke up. He said Russia remained the "most aggressive foreign actor" trying to disrupt the U.S. political system. "The warning signs are there. The system is blinking. And it is why I believe we are at a critical point," Coats said. The remarks came the same day the Justice Department announced the indictment of 12 Russian military intelligence officials for hacking into Democratic Party emails in 2016. Trump, standing alongside Russian President Vladimir Putin in Helsinki, acknowledged Monday that he had been briefed by Coats. "We have been clear in our assessments of Russian meddling in the 2016 election and their ongoing, pervasive efforts to undermine our democracy, and we will continue to provide unvarnished and objective intelligence in support of our national security." Former CIA director John Brennan tweeted that Trump's remarks were "nothing short of treasonous." Former director of the CIA and the National Security Agency, Michael Hayden, told NPR's All Things Considered he wouldn't have gone as far as Brennan's condemnation, but he said Trump's performance "was a surprise." "I was quite willing to comment on the press conference — something along the lines of, 'could have been a lot worse' — until we got to the end," Hayden said. "It could not have been a lot worse." Steven Hall, the former head of the CIA's operations in Moscow, also told All Things Considered, "The first thing that came into my mind was, 'Good Lord, how could this be happening?' This was so far off, and just so bad that I was really astounded and speechless." The Republican chairman of the Senate Intelligence Committee was also sharply critical. Richard Burr of North Carolina said his committee has no reason to doubt the intelligence community's "conclusion that President Putin ordered an influence campaign aimed at the 2016 elections." "Vladimir Putin is not our friend and never has been. Nor does he want to be our friend," Burr added. "We must make clear that the United States will not tolerate hostile Russian activities." "Yes, I did. Because he talked about bringing the U.S.-Russia relationship back to normal," Putin said. The Russian leader did not say what actions, if any, he took to support Trump.